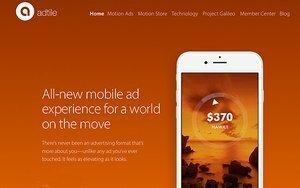 Adtile, a mobile advertising startup, announced that it has raised $2 million in an extension round of its $4.5 million Series A round in 2014. The company also announced a partnership with Singapore Press Holdings (SPH), a media conglomerate in Asia. The money will be used to expand the company’s research and development efforts. The conceit of the company is to use the available sensors on consumer’s devices to make ad campaigns more engaging. Using a format Adtile calls motion ads, marketers can design campaigns that interact in three dimensions with shaking, turning, or other forms of motion. "Motion-sensing technology is going to play a major part in the way we interact with our mobile devices and this funding extension will allow us to continue our research," stated Nils Forsblom, founder of Adtile Technologies. The company says that its ads receive high engagement rates (30%), longer participation times (23 seconds) and an average click through rate of 5%. Adtile’s Motion Store, a cloud-based creative platform that allows for the creation of campaigns that utilize motion sensors, was reportedly a big part of the partnership with SPH. The company also announced that they’d been granted a patent on their Multiple Panel Touch User Interface Navigation technology. It allows app designers to replace the standard five-button navigation panel at the bottom of apps with a swipe motion that will allow for more space and features for users.